Sweetheart Teddy Bear is gentle loving soul with a heart sewn on her tummy. She is handsewn from soft luxurious curly pink mohair fabric. She has glass eyes and a cute nose which I handsculpted. Sweetheart is 15cm short when sitting. She is filled with safe polyester stuffing with steel shot in her tummy which gives her a satisfying weight when you cuddle her and keeps her sitting upright. She is a fully jointed bear with movable arms, legs and head. 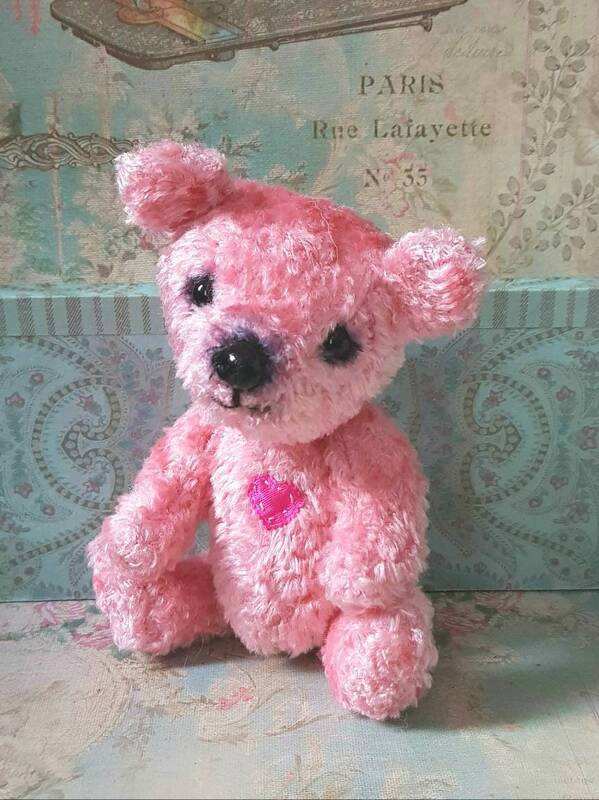 Sweetheart Teddy is not a toy and is a collectible artist teddy for bear loving folk aged 14 and over. My critters come from a smoke free home. They travel in a comfortable gift box with a handmade adoption note.